As Oscar night grows near, it's time for a quick review of THE DEFINITIVE movie list of 2013, my Top Ten List! Now keep in mind I have not seen EVERY film this year. Nebraska is still high on my list of movies to watch and I hope to see it this weekend. The list below represents the 10 very best movies released in 2013 that I saw either in the theater or on video. By a quick tally I saw 27 movies in the theater this year. A nice total but not as much as I did in 2012. The whole getting a house and getting engaged marquee life events probably impacted that total a bit. Nevertheless I feel that 2013 was a solid year for film but I only gave 2 5-JR ratings which is half as much as I gave in 2012. Here we go... in reverse order as always. One of the more well-acted films of the year. The story of Ron Woodroof and how he copes with his blindsided diagnosis of Aids by forming an underground medical treatment group is an engaging and interesting look at the epidemic of the disease in the 1980's. Jared Leto is excellent in a slightly showy role as a transgender woman but Matthew McConaughey steals the show in easily his most complete and impressive performance of his acting career. This is a film I missed in the theater but caught on video a few weeks ago. Jake Gyllenhaal shines as a troubled detective who investigates the mysterious disappearance of two young girls. Hugh Jackman gives an intense and believable performance as the father of one of the girls, who is convinced that a mentally unstable young man (played by the always brilliant Paul Dano) has kidnapped his daughter. Director Dennis Villeneuve does an amazing job of painting dark visuals with expert cinematography in one of the most gripping and disturbing films of the year. The strange ending prevents this movie from ranking higher on my list but this is a film that everyone should catch on video if they missed it. Another year, another JJ Abrams movie in my top 10. Abrams is able to take the excellent world he crafted in the original Star Trek reboot and kick it up a notch with a solid story, amazing effects and excellent acting across the board. Benedict Cumberbatch plays the film's villain with a smooth demeanor and quiet confidence that helped him shine in multiple roles across television and film in 2013. I'm eager to see where this franchise goes in the next installment. Probably my most controversial film of 2013. I got a serious backlash against my 4.5 JR rating of this movie but I stand by my ranking of this film in my Top Ten. Guillermo Del Toro crafts a visual feast for all sci-fi fans as his giant Robot vs Robot movie is extremely intense from start to finish. The grand scale of the visual effects is enhanced greatly by expertly crafted 3D conversion. Sure, the acting is a little wooden and the plot is strange at times, but the sheer spectacle of Del Toro's vision and the excellent visual effects execution turn this movie into a very entertaining ride. Spike Jonze takes a unique look at the future of "online" dating in this love story between a socially awkward loner (Joaquin Phoenix, back in his sweet-spot as an actor) and his computer's artificial intelligence personal assistant (voiced by the sultry Scarlett Johansson). The concept is a bit strange, but Jonze's unique take on love in the 21st century is thought provoking and beautifully illustrated on-screen. Amy Adams, Chris Pratt and Olivia Wilde give good supporting performances in a movie that should be caught on rental for sure. The master of you-are-there tension and quick-cutting filmmaking, Paul Greengrass, delivers yet another gripping masterpiece with this true-story adaptation of Captain Richard Phillips and his kidnapping at the hands of Somali pirates. Tom Hanks, who was disheartenedly overlooked during the Oscar nominations, gives an outstanding performance as Phillips. The last few scenes of the film show a completely emotionally-spent Hanks in one of his finest few minutes of acting in his illustrious career. Kudos to Barkhad Abdi for playing the Somali pirate leader in a very authentic performance. One of the best car racing films ever made, Ron Howard's biographical look at the dueling careers of Formula One racers James Hunt and Niki Lauda is one of the more underappreciated movies by the Academy this year. Howard's direction is brilliant and features some detailed and completely authentic racing sequences. Chris Hemsworth and Daniel Bruehl are both totally believable as the rival drivers. I feel that too many people missed out on this gem. It's hard to believe, but in a career of excellent performances, Leonardo DiCaprio saved his very best effort for his 5th collaboration with Martin Scorsese. His portrayal of Wall Street swindler Jordan Belfort is totally over-the-top, manic and most importantly, absolutely brilliant and energetic. This movie is a total blast from start to finish and even though the protagonists of the film are doing a lot of bad things (especially to innocent American investors), we as an audience ignore that aspect for the time being and relish in the raunchy, hilarious brilliance of it all. Jonah Hill gives a strong supporting performance and newcomer Margot Robbie is a gorgeous find as Belfort's hard-nosed wife. The three-hour runtime goes by very quickly in this year's funniest film. 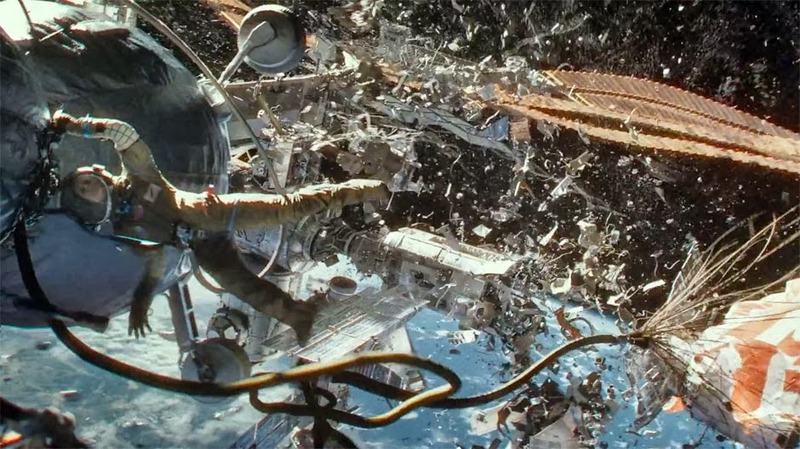 ...although I would be just a little more happy if Alfonso Cuaron's opus Gravity takes the top honors. Gravity was head and shoulders above anything I've seen in the past few years. Not since Christopher Nolan's Inception have I been more amazed and engrossed in a motion picture. The expert craftsmanship of Cuaron is readily evident throughout this trek into outer space. With clever camera angles and a minimal amount of cuts, Cuaron is able to bring the audience into space with him as we are right-there with Sandra Bullock and George Clooney, experiencing and feeling what they are feeling in real-time. The 3D effects help enhance the immersion factor and the film feels like one giant thrill ride. Coupled with a complimentary minimalistic music score and top-notch acting from Bullock (especially) and Clooney, all the ingredients are perfectly mixed for a game changing cinematic event. Cuaron is at the top of his game as a revolutionary filmmaker and I hope at least his direction will get recognized by the Academy in March. If for some reason you have not seen Gravity in the theater (*cough* Richard Rush *cough* *cough*), GO SEE IT NOW. It came back to the theater for a limited run before the Oscars and this truly is a must-see film in 3D on a big screen. That's all for 2013! Not the best year for film but one that gave us two damn good movies and one for the ages. Stay tuned for a potential Oscar blog coming up and for a podcast with Omar Latiri on his ARC platform in which we will preview our predictions and preferences regarding the upcoming awards.